You are surprised at how an expanse of shore and turquoise waters could have fended off the invasion of resorts, tour guides or even just a peddler selling Chippy. But there it was. Less than 4 hours of bumpy winding road off Puerto Princesa and you find not just a patch, but and an infinite strip of immaculate white. 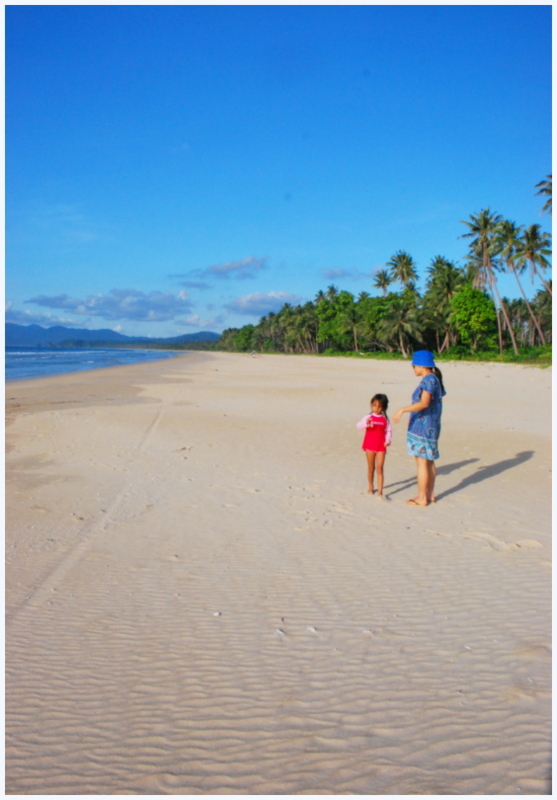 And you can stroll the 14-kilometer stretch with your solitary footprints disturbing the sand. There’s nothing else here but sea, sand and salt air. I combed the beach and didn’t spot plastic. Jutting rocks didn’t flash the typical Jhon loves Jhen or reek of urine. 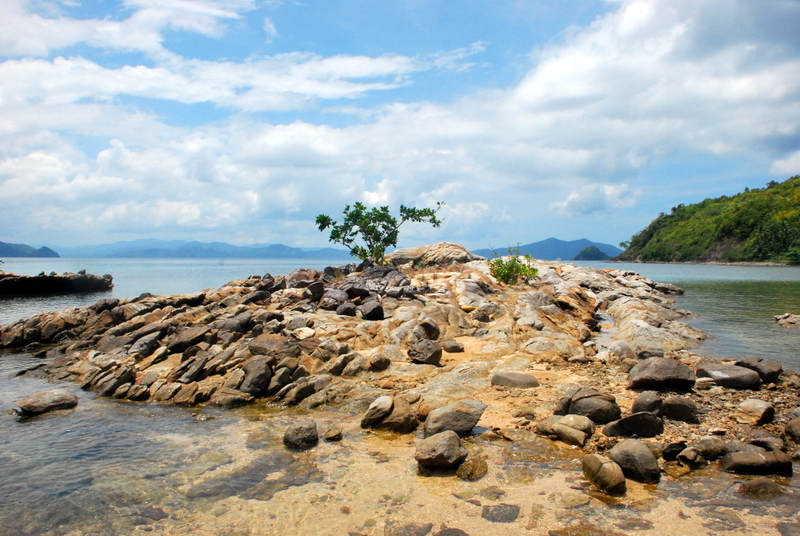 Every islet we hopped was untouched, with only fisherman huts and a 360 degree ocean view. And at dawn and dusk, I could delight in fishermen assembling their nets or bearing the day’s catch. I wish I could keep that immaculate white shoreline a secret. I chanced upon a similar beach in 1986. Twenty years later, commerce had mutated its waters to a mucky green and they were peddling pearls, 3 for P100. This time, I don’t want to scare the bayawaks, clip the wild fern overgrowth or see more heads than sand. But they are constructing an international airport a few kilometers off best-kept-secret. And already, forest fern and bayawaks are making way for roads. Government will tout it as ecotourism: ecological conservation along with economic growth and the empowerment of local communities. But business and conservation are incompatible in my side of the world. Our kind of eco-tourism brings the most number of paying tourists to the least patch of sand. How will fragile and pristine fare after millions of meals eaten, toilets flushed, milkshakes blended, blinking lights till after hours, tricycle rides and air conditioners? Everyone’s taking pictures AND leaving footprints the size of islands. We build perfect havens that run 24/7 on non-renewable energy. They look exactly like the city, except that you see blue vistas with sand in between. 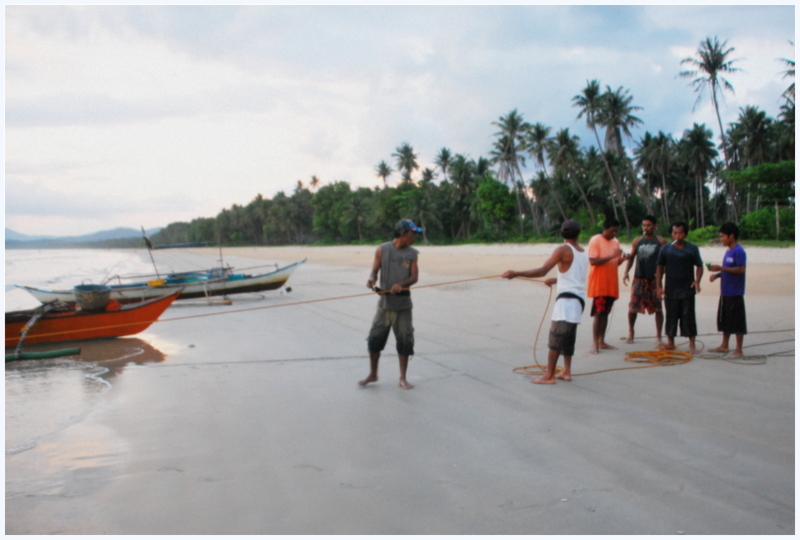 In time, the locals learn the trade, throw away their nets and put up bangketas instead. They will offer their land to displace themselves outside beach paradise. Everything will have a price (even when you unknowingly have kids convey you in a tub so you won’t wade in filthy waters.) And no matter how sophisticated tourists are, there will be wrappers to dispose and poop will need to go someplace. Fragile and pristine will not survive too much development. You will have algae in your waters, plastic in your sand, and the stench of urine reeking in rocks. Our regulations and laws on environmental protection are vague. They have conflicting provisions, overlap in jurisdiction and are difficult to implement. Best-kept-secret will probably encompass two or more local governments and be under the administrative rule of two or more agencies. There are conflicts in land use and tenure. And they never know who implements what. Enforcement is costly too. Attempt to ask a government body for environmental protection and they will ask you for a budget. I don’t blame them. Why spend your allocation on things that no one would see? Who gives a hoot about the ocean floor? Or the future lives of unborn children? Politics will demand you build a Pasalubong Center instead. Lastly, there’s a wealth of benefit when a big investor decides to build a perfect haven on your beach. And you earn brownie points when laws and regulations magically turn liberal for investment. And while government and investors squabble or get pretty chummy, environmental and social losses swell. The fish catch will dwindle. There will be algae in the shores. The fisherman will pack up his hut to settle elsewhere. Sons and daughters will forget to fish, but peddle or master massage instead. They will figure out that tourists dish out extra for the biggest catch and will pay premium for a coral necklace. Big investors will disremember their promises to reinvest profits in the community, choosing to reinvest in themselves instead. And your pristine blue and powder white ecosystem is degraded, your coastal community exploited. We don’t get to keep our fragile pockets of paradise. Business is seemingly at odds with nature, this side of the world (where we are blessed with 7101 pockets of paradise). But I know it’s been done. Humanity and nature, co-existing. Harmoniously. Stewardship is the tall order we get on the first chapter of the Bible. And we’re supposedly infected with biophilia, an innate bond between humans and nature. I have seen three small resorts do it. But they’ve kept their havens small. Managed their numbers. It’s a delicate balance between economics and ecology. Yet tourists pay a high premium to visit these fragile and unspoiled pockets of paradise. No lights at night. Mosquito nets. No escape to the sweat and the sand. But there’s a turtle hatching just outside your door. And the water is perpetually crystal blue. I wish I could keep a secret. With no one there, there won’t be any footprint to a 14-kilometer sand strip. But the reality is they are building a tarmac to paradise. And I only have my pen, a fair amount of griping and some faith. 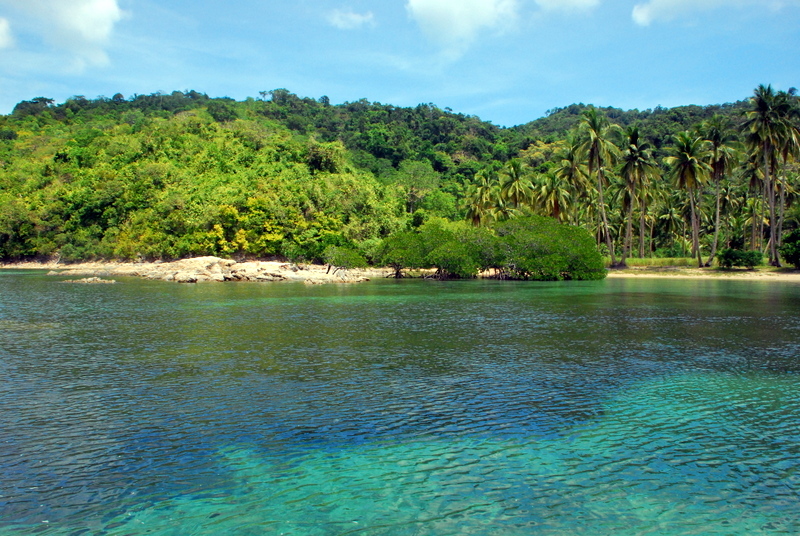 I wish I could hang on to an expanse of shore and turquoise blue waters. Or even just ensure they won’t be peddling Chippy.